Seven: Everyone has a story. Every camper brings their own story to the table, and experiences the camp in their own unique way, with their own perspectives, goals and ambitions. Six: Enable others to connect with each other. It turns out that AuctionWally enjoys Voodoo Steve’s indie podcast. How cool is that? And many folks were not familiar with Amherst native John Robison before the camp. 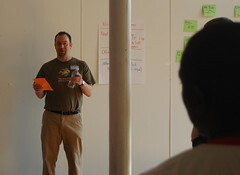 But everyone in his session came away with newfound knowledge and respect. Five: Help others build their networks. It’s not about the size of your own network, it’s about how many connections you can make for others. That’s why I put the ‘Follow Me on Twitter” poster sheets up on the wall; to enable campers to continue the conversations. Four: The spirit of PodCamp can be found in the little things. 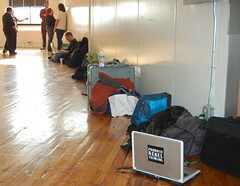 One of my favorite photos is this one of laptop bags lined up against the wall. Three: The spirit of PodCamp can be found in the spaces. Yes, the sessions are usually excellent. But I learned from BarCampBank SF how great it is to allow ample time between sessions and leave a huge long lunch break. This is what really allows campers to connect with each other, and many times it’s these break conversations where new things are shared and learned. Two: The buzz spread more AFTERwards. For an inaugural event word spreads more AFTER the event. 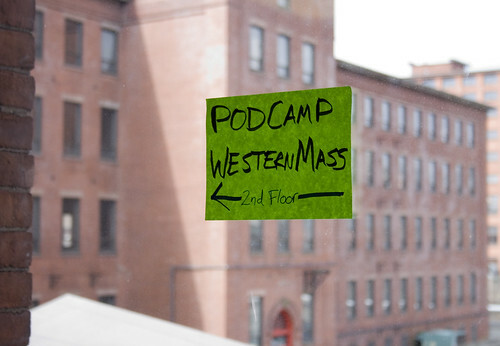 WesternMass has never had any sort of ‘camp’ event before as far as I know. So even though many invites went out, many did not see the value in re-arranging their schedules in order to attend. But now that we have 14 GLOWING blog reviews of the camp, interest is piqued in a wider audience. So we’ll hold version two in about six months. If you are considering trying to get any type of new event off the ground, make sure it is WELL RECORDED online the first time out. One: Seeing the camp through others’ eyes. This is actually one of my greatest joys of PodCamp. Being a ‘camp veteran, I take the open discussion and flexible format for granted. But since so many bloggers, photographers, and videographers attended, I get to experience the joy and wonderment of their first camp experience through their lens. 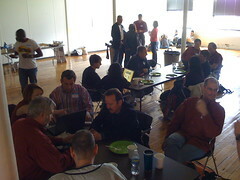 Last Saturday, March 28, 2009, we held the first PodCamp in Western Massachusetts. I wasn’t familiar with any “camp” event before Robbie Wright invited me to the first BarCampBank in North America, BarCampBank Seattle in the summer of 2007. I didn’t attend, but after reading the glowing, superlative-laden blog reviews of it, I wished I had rearranged my schedule after all. And thus began my quest of ‘camp‘ discovery. I subsequently attended FacebookCamp Toronto 2, shortly followed by PodCampBoston 2. Even before attending this event, I thought that we were getting to the point where we could hold a PodCamp in the western half of Massachusetts, and convened an exploratory planning meeting with co-conspirators, nationally recognized social media maven Tish Grier, and well-connected writer, reporter, and traveler Jaclyn Stevenson on October 16, 2007. 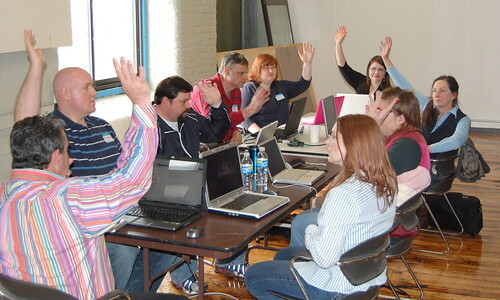 Life, and other ‘camps intervened over the following months, and it wouldn’t be for another year that we held another organizational meeting for PodCamp WesternMass. Finally, we just had to pick a date and make it happen. And boy, did it happen. Tish and Jaclyn were in their element, getting the word about the camp out to everyone in their networks. A terrific surprise to me was that Jaclyn put the press release out on Pitch Engine, a fully web 2.0, social-media-compatible press release site, and this garnered attention from many in the region. The day arrived, and it was all wonderful, start to finish. I facilitated getting the sessions onto the grid, and finding the right attendees to lead some of the sessions requested. We basically had two tracks going throughout the day, a beginner’s track for newbies, and a more advanced track for those already involved in social media. I was gratified that several video bloggers recorded the day, including Voodoo Stevie who even live-streamed some of it. And many pictures were taken by me, Jaclyn, Shawn Toohey, and Stephen Sherlock. At last count, we have 13 blog entries, 6 pages of video, including two montages set to music, 140 photos, and too many tweets to count. A huge congratulations to Tish Grier and Jaclyn Stevenson for a smashing PodCamp success! May there be many more!